taking shots alone is a two part, genuine and honest, upchuck of 21st century expression. “[I’m] hoping that somehow I make it important for you to know me…” is how the second book concludes. These quick poetic vignettes speak to the all-too- real quarter-life crisis that affects Generation Z. taking shots alone is the essence of a million tweets boiled down to their poetic truth. Every day we sign onto social networks to make it known that we are known fighters against the impermanence of our own existence. 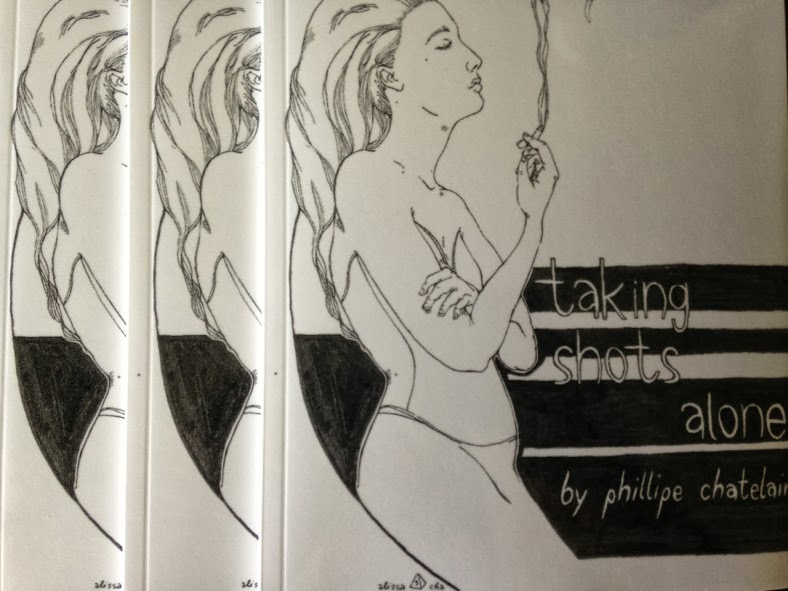 The first part of taking shots alone deals with the author’s fear of death. It is something that seems to be everywhere for him. “I’m busy slowly dying,” is juxtaposed with preparing a simple lunch. The quick nature of these poems speaks to an imminent and approaching death that is all too close for comfort. The poems are short, and by nature they must be; if death is lingering that close, then we must throw as much meaning and beauty into the world as we can. We must leave a mark. Even if that mark is 140 characters long. He is alone with the Dellilo cloud of infinite data. The news is scrolling. Life is probably ending in some town, in some country that no one has ever heard of. A generalized news story is probably all they get in recognition of their existence. This saturation of doom frightens Chatelain. He is not satisfied without leaving us something more than a CNN news scroll. He wants us to be unified with him. He wants us to digest his knowledge instantly. He wants to transcend a 140-word count and become a headline. In a sense he is speaking as a prophet. He must fight fire with fire, though. He knows in order to reach us, he must communicate with us. He must insert his dogmatic news scroll inside the larger news scroll. His style is the art of positive subversion. Steve Roggenbuck, an internet blogger and poet, was recently called a prophet by The New Yorker, in regards to his own self-published books of flash poetry. Chatelain’s work is a nice parallel to Roggenbuck’s style. They both are quick bursts of emotional energy charged to the utmost, as they are all in the moment. Chatelain declares, “No commas can slow me down,” and they do not slow Roggenbuck down either. Neither poet is concerned with pedantic grammar, intricate metaphor. In a world where death looms so near, where we collectively wonder, “if I exist,” there is no time for the subterfuge of conventional poetry. Chatelain and Roggenbuck become rebels with their work. If they do not care about political correctness and are only concerned with what is emotionally true, then they are succeeding. every time you speak it. Is this not a rebel’s declaration? It is also the most profound truth in this series of poems. Is that not what every poem is? In Chatelain’s case, he is stripping away convention. He is learning art all over again, creating a new form. By doing this, he hopes to leave his mark. When he meets tragedy, he wants to be able to enter it with contentment. His existential crisis becomes self-referencing. Again, he uses fire to fight fire. Hopefully by speaking to a Smartphone laced population using the quickness they are addicted to, maybe he can break the vicious cycle. Maybe Chatelain can make us press pause. Through his instant messaged poetry, maybe he can make us take a step back from the screens and realize we are not living. Distracting ourselves and isolating ourselves with irrelevant media is an escapist form of entertainment, and it harms the unity Chatelain dreams of. This flash style of poetics, spearheaded by Chatelain and Roggenbuck, is undoubtedly a substantial branch of contemporary poetry. It is worth the discussion, the dissection, the pause and step back, and the analysis. This is the goal of taking shots alone. As a legitimate form of poetics, this two part collection completes its mission.